Dock Panel term in Xafari refers to additional custom View that displays within freely positioned containers. 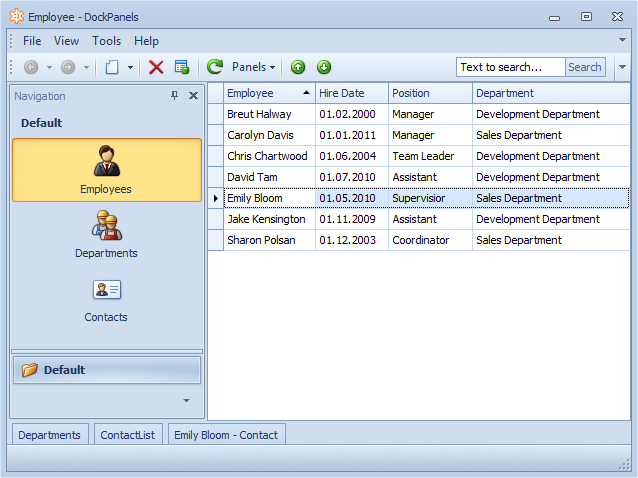 Dock Panel is always accompanied by a certain "main" View or specified business object. It provides the user with access to additional useful information, at the same time a dock panel does not occupy the client area of the main window. 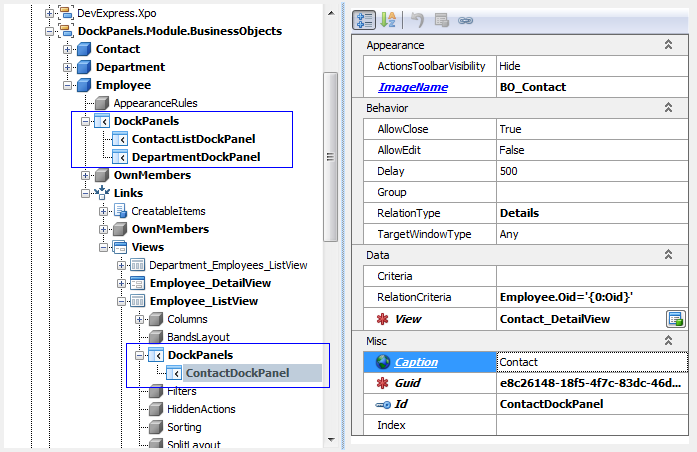 Adding and customization of a dock panel is made entirely in the Application Model. A developer can set a master-detail relationship between the data in the main View and the dock panel. 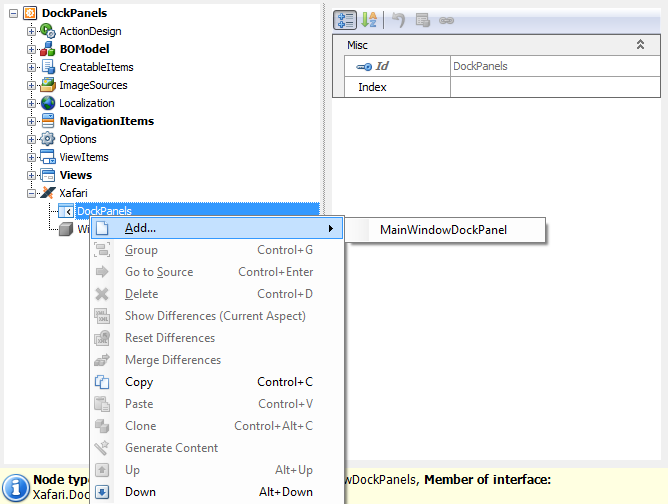 The user can move a dock panel and attach it to different areas of the parent window. The image below shows different variants of dock panels placement in a Win application. The user can also temporarily hide a dock panel and thus easily customize the application interface in accordance with personal requirements. If moved to any location on the screen that is far enough away from the edges of the main window, the dock panel will remain floating and will be displayed in its own window, independent of the main one. If the dock panel is no longer needed, it can be removed from the screen. Special Action, called Panels, is intended to manage dock panels: open and close. In order to add dock panels functionality to an application, follow the steps below. The image below illustrates adding a dock panel to Xafari|DockPanels node. To use Dock Panels in a Web application you need to perform additional operations. 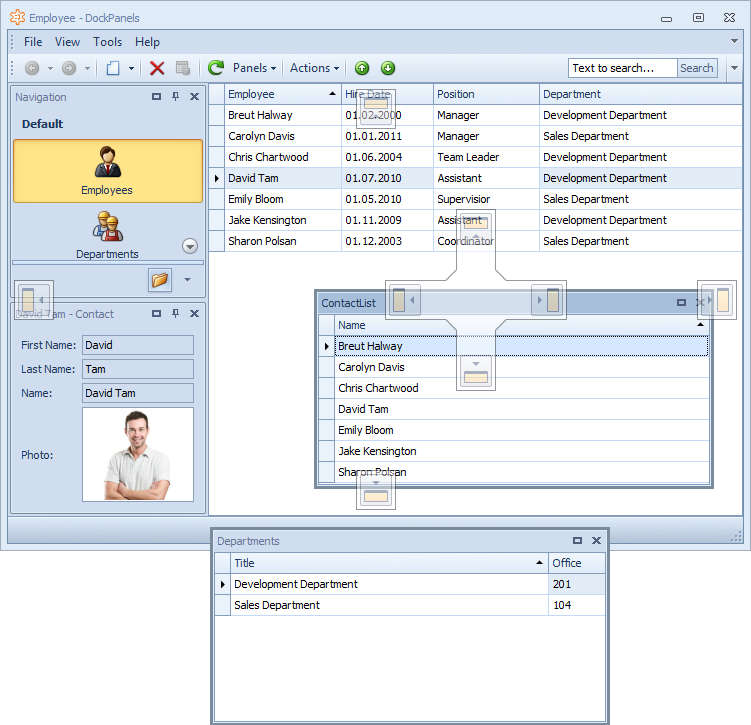 It is necessary that ASP.NET Template Content implements IDockManagerHolder interface. Let’s consider one of the ways to do this. That's all. Now you can build and run your ASP.NET application, and work with dock panels. 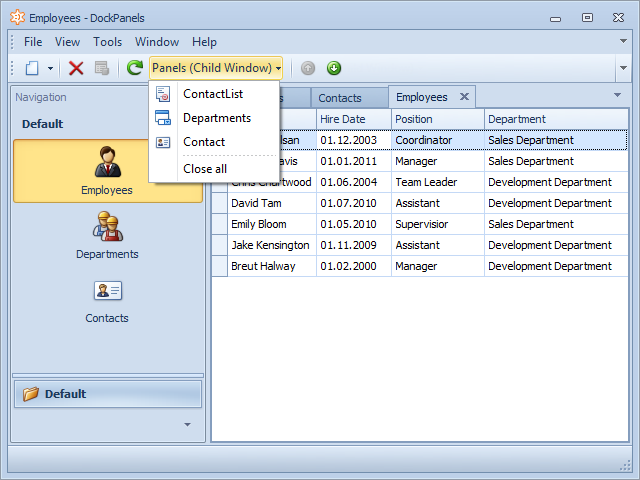 XAF supports Win application mode with an interface in the form of tabs, i.e. each new window is opened in a separate tab. 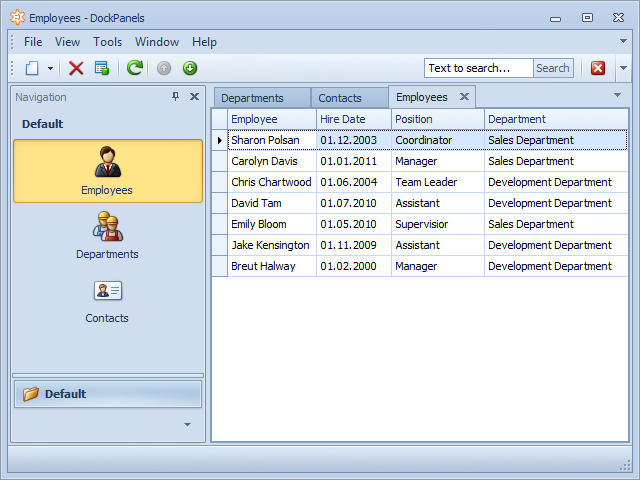 Image below demonstrates Department, Contacts and Employees business objects displayed within separate tabs. 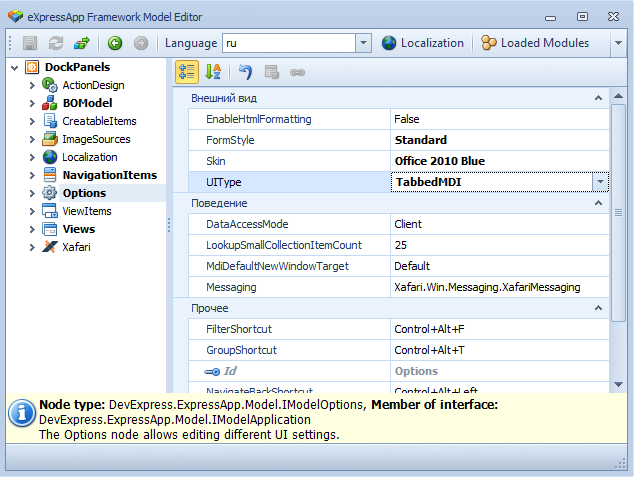 To activate this view mode, it is enough to invoke Model Editor and set UIType property to “TabbedMDI” value. However, TabbedMDI does not support Dock Panels. 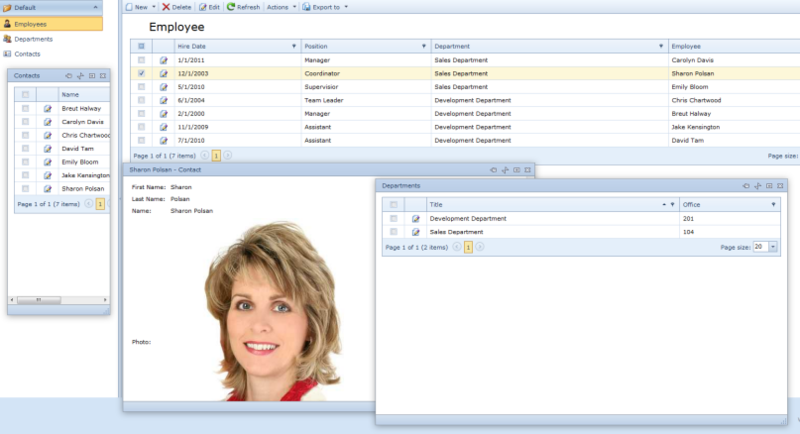 Image above shows that the Panels Action button does not accompany the Employee_ListView, despite the fact that there is Dock Panel for this entity. Now you can build and run your Windows Forms applications, and see what they look like after these changes. We hope this article was helpful. Don't hesitate to contact us in case you have any questions.